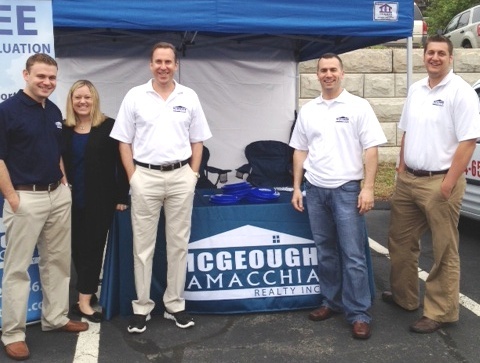 For the first FOX25 Morning News Zip Trip on May 25, John and Anthony went to zip code 02150 in Chelsea, Massachusetts. 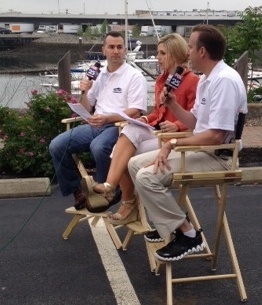 John McGeough, Anthony Lamacchia, Sarah Chaisson, Mike McGrory, and Adam Pasciscia were in Chelsea at the Admiral’s Hill Marina with the team at FOX25 Morning News. All right Cindy thanks very much, time to take a look at the real estate market this morning our guests are John McGeough and Anthony Lamacchia of Lamacchia Realty thanks for coming out with us, guys! I was going to say you’re a couple of tough guys in your t-shirts out here, it’s killing us out here this morning! We packed sunscreen but we don’t need it yet. I think our lights are brighter than the lights from above right now but we’re going to make it through, it’s nice out here. Let’s talk houses here in Chelsea there’s some lovely options for the folks out there and I believe the first one we have is actually is really close by let’s talk about this one. They’re all fairly close. This first one is 120 Commandants Way, really a beautiful single family home, it’s brick on the outside, built in the 1930s, it has 3 beds, 2 baths, about 1800 square feet, the nice part about is though is it’s waterfront property, it’s got this unbelievable patio, so you can look right out on the waterfront so we love this place, it was just dropped $100,000 so we’re surprised it hasn’t sold yet. All right let’s talk about house number two: where’s this one? 31 Breakwater Drive, it’s a $354,000 condo, 3 bedrooms 2 and a half bathrooms, four levels. I actually should say townhouse style, four levels, really nice place, a lot of space, 2000 square feet. That’s right and that’s in the Admiral Hill Complex, 60 units in that condominium complex, and that’s 354,000? Once again that’s a great deal. Ok, it’s the same complex a corner unit top floor so you get a 180 degree sweeping views of the harbor, you’ve got a private balcony, so once again, 2 beds 2 baths, a little smaller, but once again it’s very quaint, very well decorated, a very nice place. [to Anthony] I think we’re having trouble with your mic right now so you can talk all you want but we can’t hear you! We’re going to make you do some of the talking, John. Let’s talk about these and they’re really incredible and all of them really close to the water. And that last one just under $300,000, what a deal! A really good deal, I mean Chelsea is like this hidden gem we were talking about it earlier, it’s waterfront in many cases, as Anthony had said though nobody can hear him, close to Boston, and I always say it’s kind of like a mini-Charlestown, it’s starting to gain some momentum, you’ve got an urban feel with it, so all of these are wonderful opportunities, especially now with mortgage rates so low. As far as communities go, it’s easy access, probably one of the more affordable waterfront areas around here. Chelsea obviously, like most markets have come down so it’s become more affordable, we anticipate it’s going to start to come up in the market. You do, you’ve got even though we didn’t highlight them, a lot of loft construction that was built around 3, 4, 5 years ago, so once again these complexes are only about 10 years old. Chelsea is the smallest city in Massachusetts 5 miles north of Boston, with a population of around 35,000 people. Chelsea is an ethnically diverse community conveniently located close to Logan Airport, and just minutes from North Station in Boston via the Newburyport/Rockport commuter rail line. Chelsea boasts over 30 parks playgrounds, open spaces and community gardens. A new large scale waterfront renovation project, known as the Publicly Organized Recreation Territory, or PORT project, began last month and will involve dismantling large oil tanks that obstruct spectacular views of the Chelsea River to make way for a new park along Marginal Street. What makes Chelsea a great town to live in? Chelsea has a vibrant Arts community. The New England Sculpture Service is located on Arlington Street in Chelsea and is the only commercial art foundry in New England. Bronze sculptors from the Boston area and beyond come to this place to cast their sculptures. The Apollinaire Theatre Company stages creative plays at their elegantly restored theater called the Chelsea Theatre Works. The Chelsea Theatre Works has become an anchor for the revitalization of Chelsea Square. Chelsea has some great local eateries as well, including Floramos which is known for its steak tips and friendly service. Other popular restaurants include the Newbridge Café and Curly’s, which has an eclectic mix of Salvadoran, Mexican, and American food. Chelsea is an affordable city to live in with a short, easy commute to Boston. Over the past 18 months, the average selling price for a single family home has been around $200,000; the average price for a condo is about $150,000; and multi-family properties sell for about $260,000 for this time period. Do you live in Chelsea? Tell us what you like most about Chelsea or send us your photos!